No one in the small town of Placentia, California is surprised when Benny Needles's house catches fire. The outside hasn't seen a paint brush in years. The inside is stuffed with Dean Martin memorabilia. It would be a simple case of homeowner negligence, except for the body found inside. 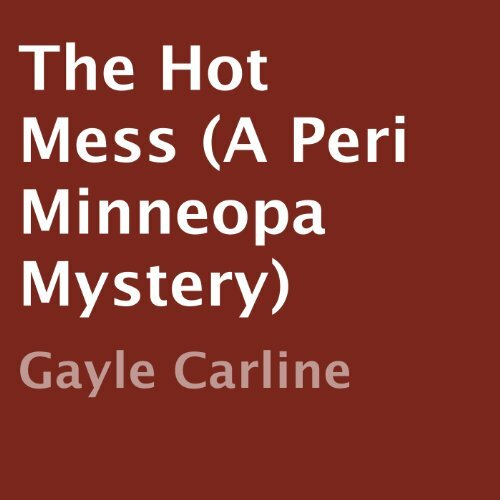 Under suspicion of both murder and arson, Benny turns to the one person who has always helped him, private investigator Peri Minneopa. Fire investigation isn't on her menu of services, but Peri's weak spot for Benny overrules her reluctance, and she agrees to look into things. Her investigation takes a dangerous turn as she uncovers family secrets, going back several decades. There are skeletons in everyone's closet, and even Benny's bones are rattling. Would you listen to The Hot Mess again? Why? Read but don't listen to Peri Minneopa books! What did you like best about The Hot Mess? What did you like least? I will start with the least liked... the narrator! Benny's unusual personality reminded me of some patients I had as a nurse years ago whose quirkiness I enjoyed. Benny was what/who I liked best. Actually, the writing was very good, only 2 characters, Benny and Peri, had any personality to develop since they were the only characters who it was necessary to convey who they were related to the plot. I thought the relationship between Peri and Skip was totally unbelievable due to the narrator's total inability to speak like an adult either male or female. I like the ending of the book related to Peri and Benny. If you’ve listened to books by Gayle Carline before, how does this one compare? This was my first Gayle Carline book. I won't pay for any audible books, regardless of the author, or how good the reviews are if they have this narrator. I will read the printed copy of any subsequent Peri Minneopa books but Benny will not be as enjoyable without a voice. I like the author's work. I kept listening because I paid for the audible version. What didn’t you like about Wendy Pitts’s performance? Wendy Pitts's voice and reading sound like she is reading a 2nd-grade primer. Her voice is too young to fit Peri's character, actually, it didn't fit any of the characters she was portraying not just in the voices but the way she does non-speaking passages! In perhaps 10 years the narrator's voice will sound adult enough to narrate an adult book. I apologize to the narrator for being so critical but an audible version of any book needs to be done well for a listener to appreciate the author's work. In my opinion, the narrator's voice and manner of reading would be acceptable for teenage or youth books. Do you think The Hot Mess needs a follow-up book? Why or why not? Since I enjoy audible books a follow-up Peri Minneopa book is not necessary for me if it has the same narrator! I loved Benny's quirky character, his obsession with Dean Martin and Peri's way of handling Benny so, yes, I want more follow-up books TO READ. But only if Benny is present. I am not sure if Benny would be so enjoyable in a read-only version. If the narrator is the same I will not pay for an audible version. I received the book without cost but I paid for the audible version. I am going to ask for my money back due to the narration. This is my honest review. I would recommend The Hot Mess to friends, relatives and even perfect strangers because I like books that keep you guessing and this one does. You think you have it all figured out and then the clues don't line up. The end was a real nail biter. What was one of the most memorable moments of The Hot Mess? One of my favorite moments comes near the end when Nick tries to atone for what he has done by doing something for Benny. It makes me smile all over. Get the book and find out what he did. What about Wendy Pitts’s performance did you like? Wendy Pitts has a lot of male voices to do in this book and does them very well. For me she has perfectly matched Benny Needles voice to his character, and, of course, Peri Minneopa's voice is great. Her performance is a great asset to the story line. I was so happy to learn the reason Benny's dad left and what he did so make sure Benny and his mom were taken care of. And my absolutely most favorite moment is when Benny says, "Miss Peri, even I know people are more important than things." I love to read and I love to listen to good books read. I can still "do my chores" and "read" with audio books. The Hot Mess kept me up late because I did not want to go to bed without knowing "what happened." This is a light, funny mystery that is just plain entertaining. I love her Peri Minneopa character as well as the Dean Martin loving Benny Needles. Thank you Ms. Carline for hours of entertainment. So great to listen to, and the plot has a bunch of intrigue 5 stars!!! great story line and well-written descriptions. The readiing was super fun and a talented voice artist!! I'm going to get more of this reader, Wendy Pitt's, work'! !